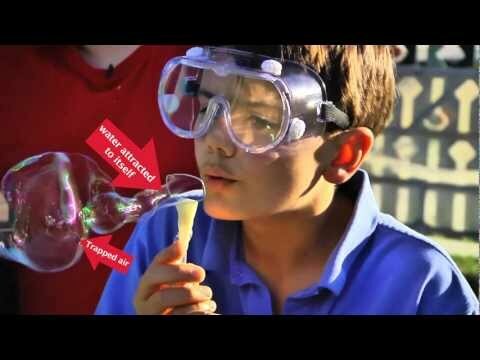 Even though most commercially available bubble solutions come with plastic wands, I feel there is a certain bit of fun in trying to engineer your own. There are any number of materials you can use to create one – the key is to make sure that it is a closed shape. In other words, a triangle, circles, square, rectangle, hexagon, and others all work because they are closed shapes. But, an arc or a line won’t work because they are open shapes. One of my favorites to build is to take about 2 feet of string, slide on two straws, and then tie the string into a knot. Dip the whole thing into some bubble solution using the straws as handles can you can get some big bubbles! But why are all bubbles round? Check out the video to learn more!